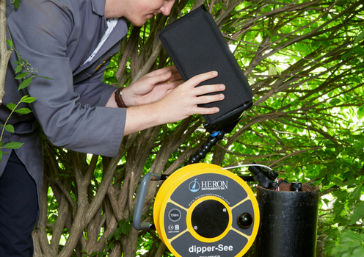 The dipper-See EXAMINER from Hoskin Scientific is a robust and cost effective vertical downhole inspection camera. Designed with portability in mind, this self-contained unit is ideal for viewing in wells, drains, vertical shafts, open bodies of water, boreholes and narrow tubes over 25mm (1") in diameter. CUES has developed a new lightweight, portable, wireless digital video inspection pole camera that can be operated by one person. The new QuickZoom III (QZIII) camera is designed to provide cable-free safe-viewing in industrial or environmental areas with no man entry. Perform swift inspections and surveys of pipelines, wet wells, manholes, sewer treatment plants, steam generators, tanks, vessels, and other areas that are difficult to reach. QZIII can also be used to locate lateral services or to identify blockages at manholes, access ports, or other entry points without entering the line or structure. CUES has developed a new pipeline inspection tool designed to significantly reduce unplanned downtime. The CUES REDI (Remote Evaluation Diagnostic Inspection) Kit is the first pipeline inspection troubleshooting kit available on the market today designed to help diagnose electrical issues, allowing for quicker and more accurate troubleshooting and repairs of problems while in the field. The release of this new product reflects CUES continuing commitment to offer the best customer support services in the business. Cansel, a software, hardware, and service provider to engineering, surveying, construction, architecture, government and printing industries announced today that it has acquired the precision location business of Trenchless Utility Equipment Inc. in Ontario and Alberta. First established in 1992, Trenchless Utility Equipment Inc. was formed to specialize in the relatively new Horizontal Directional Drill Industry. Over the years the company has become a leader in protecting underground utility infrastructure. GSSI, the world's leading manufacturer of ground penetrating radar (GPR) equipment, will be highlighting its latest GPR technology at the 2018 World of Concrete conference, to be held January 23-26, 2018, at the Las Vegas Convention Center in Las Vegas, Nevada, Booth #C3719. On display will be a new affordable UtilityScan GPR System, StructureScan Mini XT all-in-one concrete inspection GPR system, and the new Palm XT miniaturized GPR antenna for the StructureScan Mini XT. US Radar Inc. has announced the release of Radar Studio, an advanced post-processing software system designed to allow users to fully customize their GPR search experience. The new Sentinel Inspection System, from Aries Industries, Inc., is an integrated system with all components operated by an all-in-one controller. The compact, portable unit combines a lightweight reel, a quick set-up tractor and a state-of-the-art camera. Subsite Electronics, a Charles Machine Works Company, has announced the acquisition of the assets of R.S. Technical Services, Inc. (RST), an innovator in the design and manufacture of closed-circuit television remote inspection and monitoring cameras. The deal adds proven camera inspection capabilities to Subsite's robust line of Underground Awareness solutions. McLaughlin has launched a new line of underground utility locators, the Vision locators combine proven McLaughlin technologies to ensure accuracy with new features to help contractors find underground utilities more efficiently. multiVIEW Locates Inc. a professional services firm that specializes in locating and mapping buried infrastructure has announced the opening of its’ fourth office location in Kitchener, Ontario. The new location will allow multiVIEW to quickly deploy to deliver private and public utility locating services across the city and surrounding area, bridging the gap between the company’s existing Mississauga and London-based offices. The Vermeer Verifier™ G3 utility locator by McLaughlin combines trusted precision with a user-friendly interface. Contractors face congested underground conditions, unmarked utilities and increasingly strict regulations, making accurate, timely locating more important than ever. The Verifier G3 features include a combination peak and null screen, semiautomatic and manual gain adjustment, and automatic depth and current measurement index. The new compass icon simplifies the locating process by automatically calculating the peak signal and informing the user of the direction of the utility path. With the Verifier G3, users can expect the same core qualities of the Verifier G2 including: a durable design with antennas mounted in rubber isolators to standup to the toughest jobsite conditions and the exclusive McLaughlin three-year warranty and weather-proof guarantee. Users new to the locating profession will appreciate the streamlined design and simple interface; advanced operators have the option to capitalize on some of the industry’s most advanced locating technology — all in one device. GSSI, a leading manufacturer of ground penetrating radar (GPR) equipment, announces the release of the UtilityScan Pro, the latest addition to the company’s popular UtilityScan GPR product line. UtilityScan systems are the industry standard for efficiently identifying and marking the location and depth of subsurface utilities, including gas, sewer, and communication lines. Featuring the SIR 4000 control unit, the UtilityScan Pro delivers the configurability and flexibility to address a wide range of utility applications. Subsite Electronics, a Charles Machine Works Company, has introduced its most advanced HDD guidance display ever: the Commander 7. The new display offers enhanced capabilities to the TK RECON Series HDD Guidance System and delivers all vital tracking data to both the tracker operator and the drill operator. multiVIEW, a leading professional services firm that specializes in locating and mapping buried infrastructure is pleased to announce the opening of its London, Ontario office. The strategically situated office location will allow multiVIEW to complete local contract-based work and quickly deploy to meet growing demand across Southwestern Ontario for utility locating, hydro-excavation and CCTV camera inspection services. Utility relocations typically present one of the largest potential risks to delivering major capital infrastructure projects on time or on budget within urbanized areas. Until now there has been little in terms of a standardized process in place regarding the coordination of the utility impacts and the management of the effects of the utility relocations on a project. Geophysical surveys can be the bedrock (pardon the pun) of today’s environmental projects, from locating abandoned underground storage tanks (USTs) and utilities, to complex mapping of geology in remedial investigations, to finding landfill boundaries and other buried unknown problems. In the past few decades, a variety of non-destructive testing methods have gained in popularity over expensive and time-consuming drilling and digging for environmental projects. Among these, the method of pairing ground penetrating radar (GPR) with electromagnetic (EM) induction instruments is one that shows great promise in significantly reducing survey time and costs. Subsite Electronics, a Charles Machine Works Company, introduces the TK RECON Series HDD Guidance System. The TK RECON Series offers all the proven benefits of the original TK Series built on a new, advanced-technology base that allows the company to incorporate several performance-enhancing features now, and accept upgraded features in the future. While pipeline management may seem unaffordable, understanding the condition and targeting repair provides an alternate approach to wholesale replacement and allows operators to accomplish the same de-risking effort with less money. Since September 2013, GAME Consultants has been paving the way for the next generation of watermain condition assessment tools by using existing tools and working to improve the results with every project. The company’s position is to equip itself with a wide range of tools designed exclusively for use in watermains. The technologies for inspecting sewer, storm water and watermain pipes are well established and get deployed with confidence by municipalities across Canada when it comes to pipeline rehabilitation or replacement work. GSSI has announced its 350 HS Antenna, which greatly improves the depth and data resolution performance of traditional real time sampling technologies. The 350 HS is designed for use with new digital HyperStacking technology, which allows users to see deeper targets and operate in conditions considered too “noisy” for conventional systems. Easily configurable, the 350 HS antenna is ideal for archaeology, geophysics, and utility locating applications. The City of Montreal believes that the best medicine is preventative medicine, especially as it applies to its water network. Radiodetection has launched the RD1100 and RD1500 GPR utility locating systems offering a range of products for viewing and analyzing buried utilities. Pipe Restoration Inc., Technologies, LLC, (PRT), a world-leading pipe lining innovator and manufacturer of the patented, proven ePIPE pipe restoration technology, offers the fastest, 2 hour return to service barrier coating that prevents water pipe leaks, as well as bringing lead leaching into compliance. In honor of the United States' Environmental Protection Agency's national Fix a Leak Week, and United Nations' World Water Day on March 22, PRT announces that it is helping to combat the global issue of water conservation and access to clean water with the ePIPE patented leak protection process. Subsite Electronics, a Charles Machine Works Company, has introduced the 2550GR Ground Penetrating Radar System featuring a new, user-friendly Window’s-based interface that will provide operators with a number of productivity enhancing benefits. Electro Scan, Inc. has announced that it will unveil new certification standards for sewer and water pipe rehabilitation at the 2016 NASTT Conference. The Electronic Marker System (EMS) Rope 7700 series uses propriety 3M path marking technology to deliver more accurate and more reliable tracking of underground plastic pipe and fiber optic conduit. Designed as a high performance alternative to the current industry standard solution, the new EMS Rope series is available for use in the electrical utility industry. The EMS Rope Series is also available for gas, telco, wastewater and water utility applications. It’s not uncommon to use ground-penetrating radar (GPR) to map underground utilities, but some municipalities are using it to find, well, nothing at all. HOBAS PIPE has issued an eight-page brochure for the growing Canadian market. The shocking story of lead contamination in Flint, Michigan may seem like a one-off situation that most of us living in modern housing don’t need to worry about. But after reading with horror and sadness all the coverage of how officials in Flint failed to protect thousands of mostly poor Americans, including children, from ingesting dangerous levels of lead that leached from corroded water pipes, I decided to look at the situation north of the border. (Flint is only a two-hour drive from London, ON) The conclusion? While the lead pipe problem in Canada isn’t as dire as in Flint, admittedly an extreme example, neither should we turn a blind eye to it, because thousands of Canadians (the exact number is impossible to pinpoint) may also be unknowingly drinking lead-contaminated water because they live in older homes where lead pipes and fittings were commonly installed. GSSI, the world’s leading manufacturer of ground penetrating radar (GPR) equipment, will be showcasing its latest GPR technology at the 2016 World of Concrete conference, to be held February 2-5, 2016, at the Las Vegas Convention Center in Las Vegas, Nevada, Booth # C4156. Seatronics, an Acteon company, and market leaders in the rental and sale of marine electronic equipment, has announced a collaboration with Canadian-based manufacturer, Inuktun Services Ltd. Inuktun has extensive expertise in remote controlled robotic transport and delivery of multi-mission, modular technology used in hazardous environments and confined spaces. Corrugated metal pipe (CMP) is heavily reliant on supporting soil for structural integrity. As such, a condition assessment must include an evaluation of the supporting soil to be considered complete. Previously there was no conclusive and quantifiable way to assess soil condition without damaging the pipe wall – further compromising the structural condition of the pipe. For pipe diameters 6 to 12 inches using the inline version or 12 inches and greater for the parallel chassis, the Versatrax 150 Mark II is capable of penetrating as far as one kilometre in a single deployment, more than 540 metres further than the standard Versatrax 150 pipe inspection vehicle. In June, ASI Marine (ASI) personnel conducted a remotely operated vehicle (ROV) underwater inspection of the Cheves Hydropower Tunnel in Peru and ended up breaking the ASI company record for the deepest flooded tunnel inspection at 570 metres water depth. The Cheves Hydropower Project is being developed by Empresa de Generacion Electrica Cheves S.A., a wholly-owned subsidiary of Statkraft, a Norwegian electricity company. Trimble has introduced the Spectra Precision DG613 and DG813 pipe lasers, a new generation of DialGrade lasers for the installation of gravity flow pipelines. The Subsite Electronics UtiliGuard utility locating system has numerous industry-first features that combine to offer unprecedented locating accuracy.